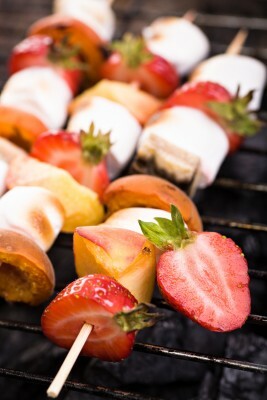 It’s coming into late summer – which is often the perfect time for a BBQ. The days are long, the sun shines until late evening and the days stay warm too – which if you ask us, is the perfect BBQ weather. But if you want to do something a little different – and break away from your traditional BBQ treats (such as the burger and hotdog) why not try our amazing list of alternative BBQ snacks? You’re guaranteed to love them! 1. For someone with a sweet tooth…. For those times when you want something sweet and tasty, try peeling a banana and then cutting it in half length-ways. Purchase a Mars Bar and then slot the Mars Bar between the banana. Next step: wrap in tinfoil and place on the BBQ to melt. If you love Banoffee pie – you’ll absolutely adore this sweet BBQ treat! 2. For the sophisticated BBQ…. For those with a more sophisticated taste, then why not try BBQing some lamb. You can skewer the meat if you choose – and then simply lay over some mint leaves underneath and let the flavour infuse into the meat whilst cooking. It’s super tasty – and perfect with a pita bread and sour cream. The is perfect for those wanting to impress their BBQ guests as the smell alone will have them hooked! 3. For the kebab lover…. For cooking kebabs, try doing something a little different! Marinate your chicken in a sweet sauce and then in a separate tub marinate some in a sour tangy sauce. Then after leaving it for a day to soak up the flavours, skewer the meat in between pieces of onion and pineapple. Hey Presto! You have some delicious sweet and sour kebabs! It’s a winner every time! 4. For the fish lovers…. There is nothing better than BBQ’d Mackerel – so next time you have fish lovers around for a BBQ throw some of these on the BBQ and watch them become hooked. You don’t need anything other than salt and pepper – then just leave to slowly cook and crisp around the edges! It truly is pretty magical and pretty simple too. 5. For the Sh’more addict…. If you love your Sh’more then you’ll love this posh version! Basically, the process is the same as the normal Sh’more, but instead of just the marshmallow melted in the middle, you put a BBQ’d strawberry in there too. The fruitiness and the sweetness is pure heaven! Guest blogger: Elle works with Global Knives, the perfect place to purchase your BBQ cutting tools! You can find their range of knives at Chefs Knives online.